As of a 3/11/14 recheck, this sale is back on! Windows goes on the attack once again, bringing fire and blood to the Chromebooks which perhaps rested a bit on their laurels.Right now, for just $200, you can get the 10.1-inch 32GB HP Pavilion X2 Detachable hybrid from Amazon.com. Or you can get the 64GB version for about $25 more. Limit three per customer. It’s a tablet, it’s a laptop, and it is SSD powered, so no painful hard disk spinning. And it has a touchscreen. It is powered by the recent Intel Atom Z3736F Processor, with 2GB RAM, Intel HD graphics, 1280×800 resolution, and a battery life estimate of over 11.5 hours. You also get a one year subscription to Office 365. For general purpose lightweight computer use, I am now starting to tilt towards Windows 8 2-in-1s over Chromebooks. Thanks to the Desktop persona, you can install most of your favorite Windows apps, and you can install as many browsers as you want. And that’s before you take it to the next level with Firefox Profiles. Obviously, don’t expect these to run Photoshop or AutoCAD or heavy duty productivity software. But for email, browsers, social media, music, videos, they can be pretty, pretty, pretty good as Larry David likes to say. You still have the various frustrations of Windows, it still takes a million pointless clicks just to install a new version of an existing app, you still have to reboot every time Windows Update sneezes, and such. Great news for credit card cashback fans! 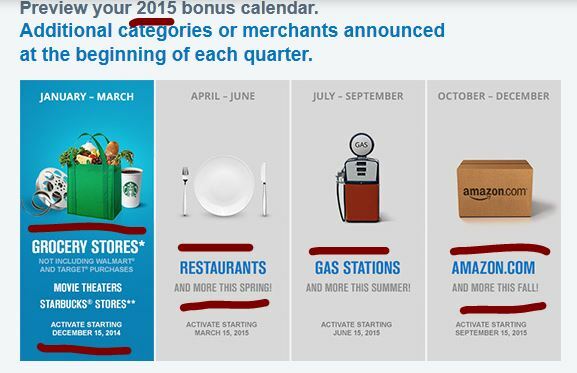 Chase has published a sneak preview of their 2015 5% rotating quarterly categories and there’s an exciting change! The first quarter is Grocery Stores! This is huge since we all need food! It has the usual quarterly limit of $1500, and some stores are not eligible (eg Walmart, Target, and other warehouse stores) as usual. But still, this is a great cashback opportunity. The maxout on this is $75 in Cashback Rewards for the first quarter (5% of $1500). Also included in Q1 are Starbucks and Movie Theatres. This increases the chances of more people maxing out the first quarter. The second quarter is headlined by Restaurants, while the third is gas stations. Both have “and more” so more options may be added. The last quarter, as usual, it is holiday shopping time, headlined by Amazon.com. For each quarter, the activation (sign-up/opt-in) for promotion is the 15th of the previous month. So for Q1, you can sign up starting December 15, for Q2 you can sign up March 15, and so forth. Another consumer-friendly thing that Chases does (I know, shocking! ), you can sign up deep into the quarter and still qualify. Tip: you can also buy gift cards at the various participating stores, so you can pre-buy your future purchases. For example, if you are a regular Starbucksaholic, you can load up your gift card for future purchases. Or buy other store gift cards through the grocery stores. Or gift certificates at your favorite restaurants or gas stations. And so forth.